If her [England’s] empire means ruling the world as Denshawai has been ruled in 1906 — and that, I am afraid, is what the Empire does mean to the main body of our aristocratic-military caste and to our Jingo plutocrats — then there can be no more sacred and urgent political duty on earth than the disruption, defeat, and suppression of the Empire, and, incidentally, the humanization of its supporters. 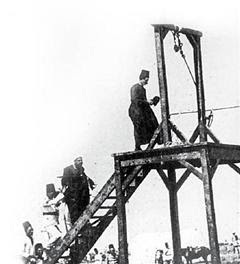 On this date in 1906, four Egyptian villagers were hanged by the British after a UK soldier died in riot begun by a pigeon hunt. Try to imagine the feelings of an English village if a party of Chinese officers suddenly appeared and began shooting the ducks, the geese, the hens and the turkeys, and carried them off, asserting that they were wild birds, as everybody in China knew, and that the pretended indignation of the farmers was a cloak for the hatred of the Chinese, and perhaps for a plot to overthrow the religion of Confucius and establish the Church of England in its place! On this occasion, protesting villagers dared a little more resistance than was usual and before long a gun had discharged in the struggle, injuring several and felling a local woman (she survived, though onlookers took her wound for a mortal one in the moment). As if by metaphor, somewhere in the mayhem, somebody’s wheat caught fire. Having clumsily escalated the disturbance that their presence had provoked, the Brits at length had to flee a small riot: one of their number died in the flight, the cause never clearly ascertained but attributed by a doctor to “heat apoplexy caused or aggravated by concussion of the brain.”** Several others were collared by the villagers, who abused them but did not kill them. As Shaw notes, in a domestic English context it might have been the gendarmes who were punished for mismanaging the situation to the detriment of the public peace. But the English occupation of Egypt disdained the hearts-and-minds approach, preferring bile and spleen. Fifty-two(!) villagers came up on charges of murder(!!) for the heatstroked officer, and the punishments meted out by a British-controlled court† seemingly aimed to maximize rancor with the understanding that cruelty was the only language the native could comprehend. in consideration of the injury to his wife, was only sentenced to penalty servitude for life … No such sentimentality was shewn to Hassan Mahfouz. 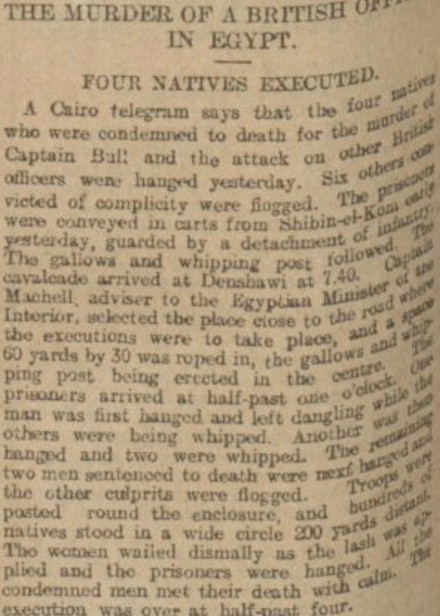 An Egyptian pigeon farmer who objects to British sport; threatens British officers and gentlemen when they shoot his pigeons; and actually hits those officers with a substantial stick, is clearly a ruffian to be made an example of. Penal servitude was not enough for a man of 60 who looked 70, and might not have lived to suffer five years of it. So Hassan was hanged; but as a special mark of consideration for his family, he was hanged in full view of his own house, with his wives and children and grandchildren enjoying the spectacle from the roof. And lest this privilege should excite jealousy in other households, three other Denshavians were hanged with him … ages of the four hanged men respectively, 60, 50, 22 and 20. Hanging, however, is the least sensational form of public execution: it lacks those elements of blood and torture for which the military and bureaucratic imagination lusts. So, as they had room for only one man on the gallows, and had to leave him hanging half an hour to make sure work and give his family plenty of time to watch him swinging (“slowly turning round and round on himself,” as the local papers described it), thus having two hours to kill as well as four men, they kept the entertainment going by flogging eight men with fifty lashes each: eleven more than the utmost permitted by the law of Moses in times which our Army of Occupation no doubt considers barbarous. But they Moses conceived his law as being what he called the law of God, and not simply an instrument for the gratification of his own cruelty and terror. It is unspeakably reassuring to learn from the British official reports laid before parliament that “due dignity was observed in carrying out the executions,” that “all possible humanity was shewn in carrying them out,” and that “the arrangements were admirable, and reflect great credit on all concerned.” As this last testimonial apparently does not refer to the victims, they are evidently officially considered not to have been concerned in the proceedings at all. Finally, Lord Cromer certifies that the Englishman in charge of the proceedings is “a singularly humane man, and is very popular amongst the natives of Egypt by reason of the great sympathy he has always shewn for them.” It will be seen that Parliamentary Papers, Nos. 3 and 4., Egypt, 1906, are not lacking in unconscious humor. The official walrus pledges himself in every case for the kindliness of the official carpenter. Shaw’s determination to humanize the “natives” by analogy to English country squires unsurprisingly stands in stark contrast to the dominant thrust of domestic reportage — which consistently describes the affair as an unprovoked attack or (still better) an outrage. Shaw, however, was far from alone in his sentiment: many British elites were discomfited by the harsh and arbitrary treatment meted out in the imperial hinterlands. Another writer, Wilfrid Scawen Blunt, bemoaned the “abominable case” and took up an editorial pen in the Egyptians’ defense — albeit more in hope than expectation, for as he confided to his diary, “English feeling on these matters has become absolutely callous, and I believe if Cromer ordered a dozen of the villagers to be crucified or impaled, no serious objection would be made to it here.” And he was right to despair. But it had by that time been long since that the chickens of Denshawai had come home to roost. In his autobiography, Egyptian nationalist president Anwar Sadat mused on the formative influence worked upon his childhood by the sacrifice of one of the Denshawai martyrs. [T]he ballad which affected me most deeply was probably that of Zahran, the hero of Denshway. I recall my mother reciting it to me as I lay stretched out on top of our huge rustic oven, half-asleep while my younger brothers (and our rabbits) had all fallen asleep. It appealed to me afresh every time I listened to it. Denshway was only three miles away and the ballad dealt with a real incident … Zahran was the hero of the battle against the British and the first to be hanged. The ballad dwells on Zahran’s courage and doggedness in the battle, how he walked with his head held high to the scaffold, feeling proud that he had stood up to the aggressors and killed one of them. I listened to that ballad night after night, half-awake, half-asleep, which perhaps made the story sink into my subconscious. My imagination roamed free. I often saw Zahran and lived his heroism in dream and reverie — I wished I were Zahran. His wish would come as near to fruition as wishes do. Sadat had the honor of announcing to the world the Egyptian Revolution of 1952 that would expel the British occupation … and thirty years later, of also giving his life for Egypt. * Not Dickens nor Kubrick could not have bested the names of shooting party participants Captain Bull (the eventual fatality) or Brevet-Major Pine-Coffin. ** That is, running away from a bombardment of stones. It appears to be permanently obscure (and subject to partisan slanting) precisely how these factors weighed together at the moment of Bull’s death. The diagnosis is quoted in the London Times, June 25, 1906. † The tribunal featured mixed Egyptian and British personnel, notably including Boutros Ghali, future Egyptian Prime Minister and grandfather of the eventual United Nations head Boutros Boutros-Ghali. ‡ At least, of their own empire. According to Aliens — Uneingeburgerte: German and Austrian Writers in Exile, the Third Reich produced a German-language play about the Denshawai incident by adapting Shaw’s account.